AMA Co. Ltd production becomes more and more popular in nearest and farest foreign countries. 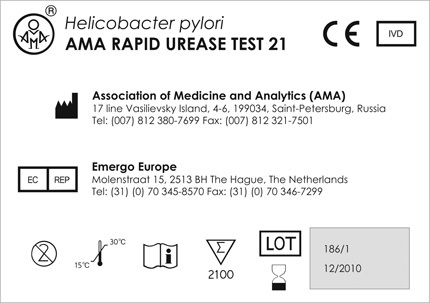 For first steps of international expansion Helicobacter pylori AMA RAPID UREASE TEST was choosen. By 2011, the each example of this product will have been marked with CE-mark. For medical products CE-marking is obligatory under demands of EU directives, that regulate specifics of transacting in European Medical Market. For domestic AMA RUT customers CE-mark will be the sign of international recognition and confirmation the high safety and quality level of this product.